Severe congenital neutropenia (SCN) is a rare heterogeneous genetic disorder caused by abnormal myeloid differentiation and susceptibility to severe bacterial or fungal infections, beginning in early infancy. Several disease causing genetic defects have been identified including mutations in ELANE, HAX1, G6PC3, GCSFR, JAGN1 and VPS45. Despite this progress, the molecular etiology in many patients with neutrophil disorders remains enigmatic. Furthermore, the epistatic relationship of the involved pathways is still unknown. We hypothesize that the identification of additional genetic defects will help to shed light on these questions. With the help of our global Care-for-Rare alliance, we offer rapid genomic sequencing for any patient with SCN, independent of ethnic origin or financial situation. Upon identification of novel sequence variants we perform functional assays using novel model systems. A neutrophil differentiation system using induced pluripotent stem (iPS) cells in combination with genome editing technology employing the CRISPR/Cas9 system has been established. A “healthy” iPS line can now be genetically engineered with the aim to introduce selected genetic defects and differentiated into neutrophils using growth factors for further analysis. 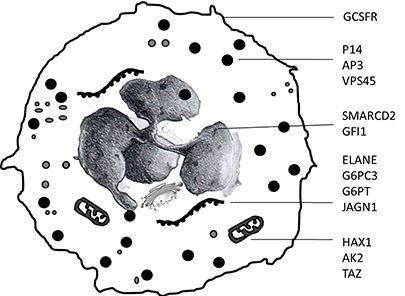 To understand the whole context of the pathways or interactions between molecules controlling neutrophil differentiation and function, the generated genetically engineered iPS cells will be analyzed by the following approaches: Functional assays for accessing migration and phagocytosis ability, the localization or expression level of target proteins and the glycosylation status of different surface proteins affecting cell migration and adhesion. ER-induced stress status will be studied by confocal microscopy, Western immunoblotting and mass spectrometry. The whole secretome will be analyzed by mass spectrometry. Comprehensive analysis of the whole genome, transcriptome and proteome will shed light on the molecular basis and the impacts of specific genetic defects. These comprehensive and comparative analyses based on iPS cell technology may uncover prospective targets for therapeutic interventions and elucidate the molecular mechanism underpinning SCN. The ultimate goal is to develop novel diagnostic and therapeutic approaches to improve the prognosis of SCN patients.